I know I promised this last week and clearly failed >_< I also failed at even getting a post up on Monday. Frankly I was a little lazy over the weekend and had some camera problems so I slacked a little bit, sorry! 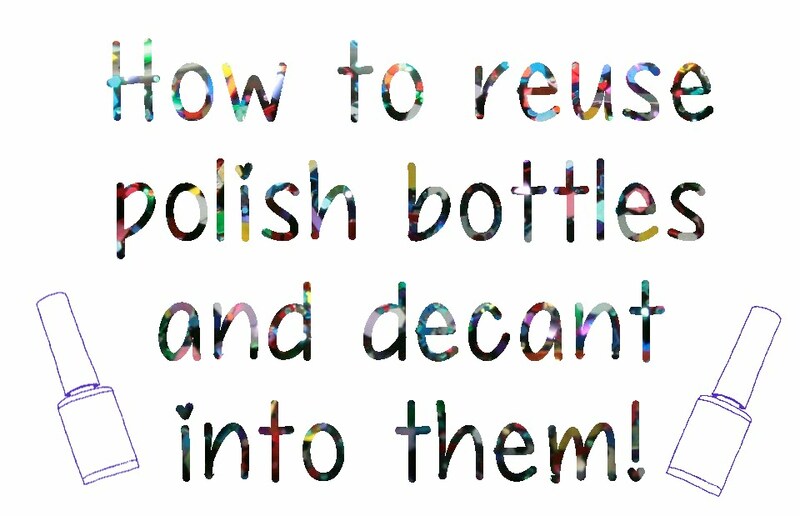 Anyways, my friend Maggie, who runs T8slady's Polish Party that you should go check out, asked me to create a tutorial for reusing polish bottle and decanting. So here it is! Please click "Read more" to see the full entry. If you specifically purchased polish to reuse the bottle in open them up! I bought these sets at Walgreens on sale for $1.50, you may still be able to find similar sets clearanced from the holidays. Pick out which ever color you want to start with. 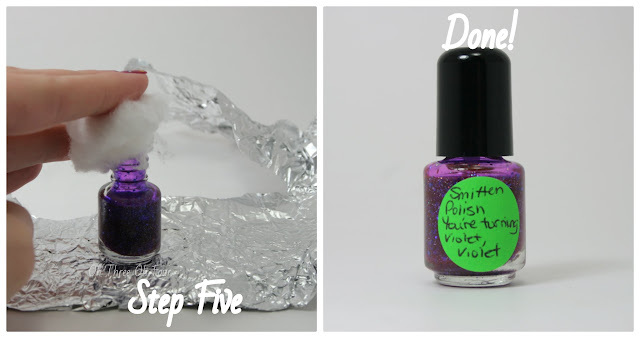 Pour out the polish into something you don't mind throwing away. I used the top of a tin (I am using the tin itself to store brushes in and really didn't need the top). Alternately you can use a piece of paper, food packaging you are throwing away anyways or really anything. Make sure to let the polish dry out somewhere well ventilated before disposing of whatever you are using. If the polish contains mixing balls they should appear once the bottle is empty. While this polish only contained one, yours can have 1, 2, 3 or sometimes none. Once the bottle is empty you should either see them in the poured out polish or in the bottle. Pour some acetone into the bottle. I opted to use a pipette to make it a cleaner process. I purchased this one at Walgreens in a two pack. If you do opt to use a pipette with a rubber top make sure you don't get acetone into the rubber part, it will eat into it. Shake it up! After shaking it up I let it sit for a few minutes so the acetone can do it's job. Pour out the acetone from the polish bottle. 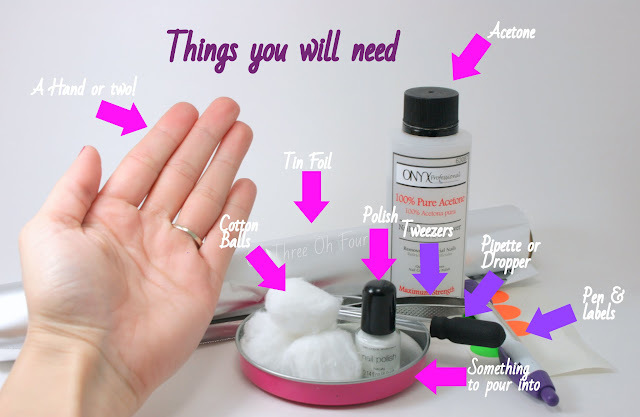 I can never seem to get all the polish out in one go of acetone, so add some more acetone to your bottle, shake it up again and let it sit if needed. While you are letting your bottle sit, remove your mixing ball from the acetone and set it aside. I again opted for tweezers, but do whatever is easier for you! Empty your bottle again. If you have really stubborn polish, you made need to do this a third or fourth time. I know polishes with a ton of glitter can be a pain to empty! If the cap of the polish is junked up with dried polish, put some acetone in to the cap. I once again opted using a pipette, but you can just pour it from the bottle if it's easier. Grab a cotton ball and tin foil and unravel your cotton ball. 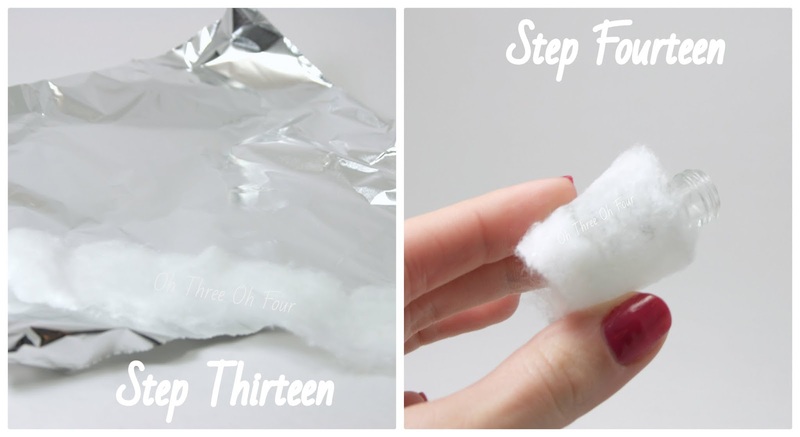 Place your burritoed bottle into your tin foil and roll it up. You should have something that looks like this. Probably better to use a little less foil then I did though. ;) Set it aside for about 10 minutes. Pour out the acetone from your polish cap. Clean off the brush in acetone, if needed. If your polish cap has a lot of dried up polish in it, you may need to remove the brush. This is simply done by giving a nice tug on the brush, it should remove from the cap and look like this. You can clean it out with some acetone and q-tips. To put connect the two back together you can either push them back together or the easier route is to place the brush into the bottle like normal and screw the cap back on. Unravel you polish from the tin foil. Remove the cotton ball. When I do the I push down on the cotton ball to start the process of removing the label. Scrub!! Some labels are harder to remove than others, so it will depend on how much scrubbing will be involved. 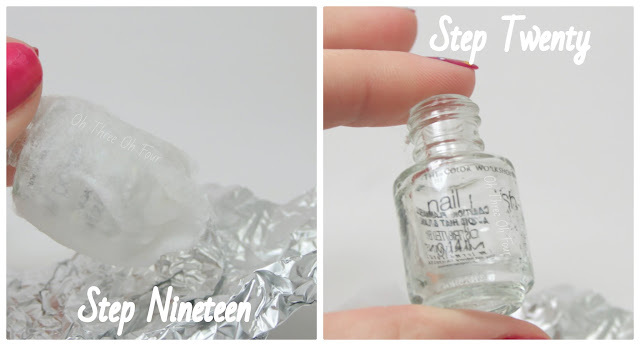 If the label is really being a pain try reverting back to step 13 and rewrapping the bottle. Grab your mixing ball and put it in your bottle. If you are just interested in a bottle to use for frankening or to put cuticle oil or remover in, you are done! Woo hoo! If you want to decant, read on! If the polish has been sitting for awhile give it a good shake to mix up everything. Clean off the bottle neck of the original polish. Dried up polish around the neck can make the bottle not close completly and allow air into the bottle, which will cause your polish to thicken up quicker.